Vyprvpn is unique from other VPN services in that they have their own in house protocol created by their developers that allows users to defeat VPN Blocking via Deep Packet Inspection. You can read more about their "Chameleon" protocol here. This is especially useful for users in China or other countries where websites (and VPN services) are heavily monitored by the government. Vyprvpn basic can be purchased monthly for $9.99 or $6.67 if you purchase for the entire year. The website is a wealth of information on how to setup and configure VPN services. The features section of the website lists all the different items that make VyprVPN special, such as having servers in 38 different countries, having no third parties for code and hardware, and special protocols that set VyprVPN apart from other VPN services. There was no knowledge base that I could find, but there are many helpful FAQs. I would say that out of all the VPN services I have reviewed, VyprVPN has the easiest to follow and broadest range of tutorials for setting up VPN on whatever device you are using (and I do mean whatever device... I was surprised to see Chromebook, Boxee Box, and Synology). Unlike many VPN service providers, you do not need to be logged in to see all the server locations, you can view the interactive map of locations here. 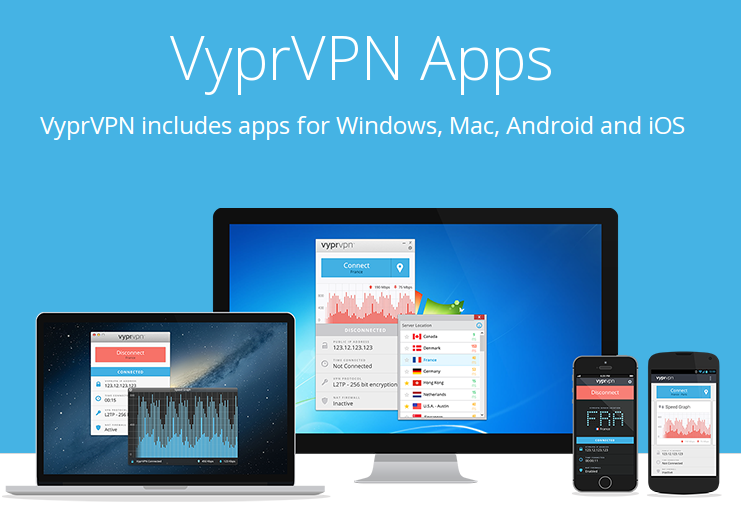 As is quite standard for good VPN service providers, VyprVPN offers free software for Windows, Mac, iOS, and Android. Not surprisingly, software for Linux is absent. What is not absent though is detailed instructions for connecting using Linux. Not only were the instructions clear and easy to follow, I was able to use OpenVPN on my Linux machine using VyprVPN (I have not had any such luck with other VPN services). VyprVPN offers live chat in case you have a problem. We are incredibly proud to introduce Chameleon, the latest innovation from our Golden Frog team! In recent years, there’s been growing concern worldwide about VPN protocols being inspected, throttled and blocked by governments, corporations and ISPs via deep packet inspection (DPI). To counter this, our engineers have developed a remarkable, new VPN technology called Chameleon that is available in the VyprVPN apps for Windows, Mac and Android. Chameleon scrambles OpenVPN packet metadata to ensure it’s not recognizable via DPI, while still keeping it fast and lightweight. Chameleon technology uses the unmodified OpenVPN 256-bit protocol for the underlying data encryption. The result is that VyprVPN users are able to bypass restrictive networks put in place by governments, corporations and ISPs to achieve an open internet experience without sacrificing the proven security for which OpenVPN has long been known. Experience a truly open and uncensored Internet with Chameleon VPN. VyprVPN has many servers from all over the world so that you are certain to find one near your location. While I didn't notice a significant speed performance from other VPN service providers (using PPTP or OpenVPN... it might be much faster with Chameleon), I did notice that I was able to connect more reliably without cutouts using VyprVPN. Great reliability and speed (check out Chameleon). Support for OpenVPN along with PPTP, L2TP/IPSec, Chameleon. 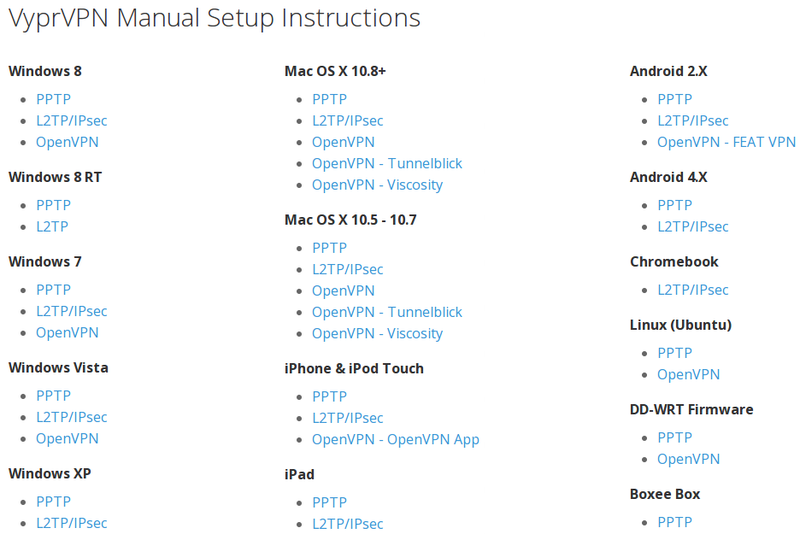 Detailed instruction manuals for setting up with many different devices. Great service in China (website works even if you are in China). Website was confusing to me at times. I was able to find everything I needed to, but not always as easily as I would have liked. VyprVPN offers a free trial, so there is no reason not to try it! Click here for the free trial. To see a list of other VPN solutions and how they compare to VyprVPN, please click here.